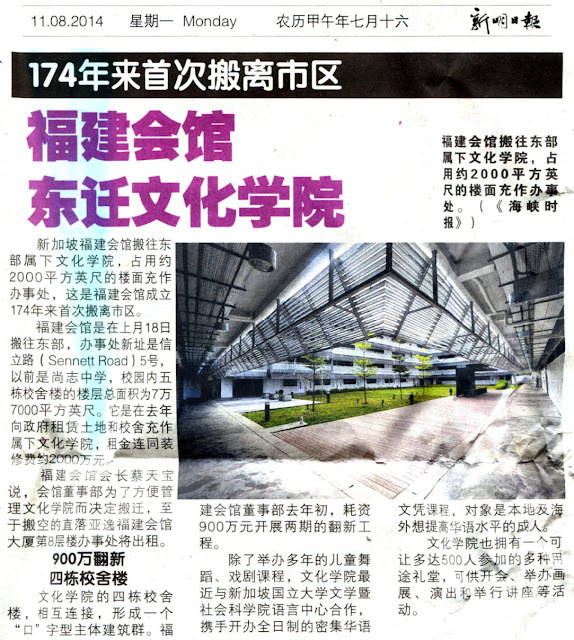 SINGAPORE - Hokkien Huay Kuan has moved house after 174 years in Telok Ayer Street, where the Chinese clan association for all natives of Fujian province in China here was founded. 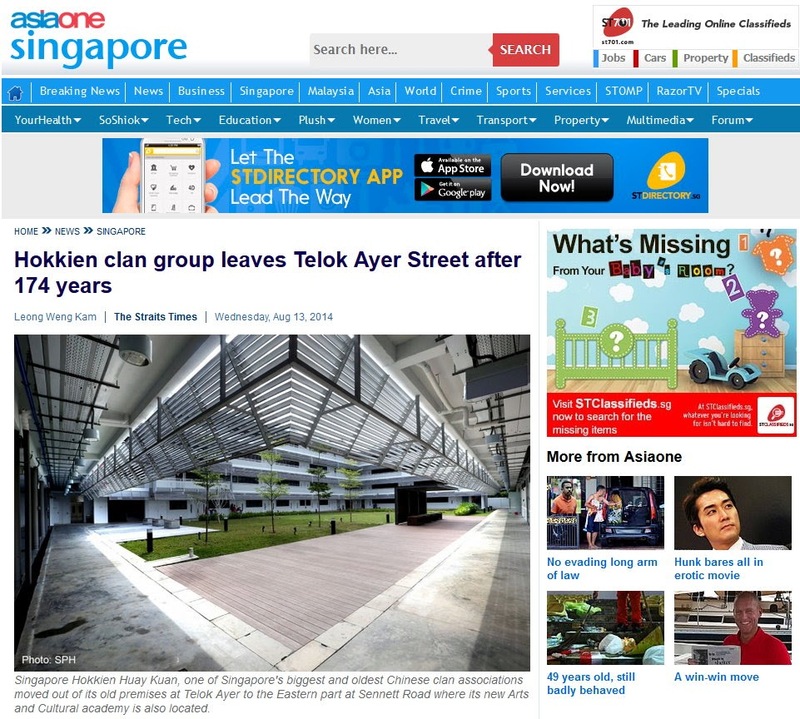 The top clan association in Singapore - with over 5,000 members - has moved from its eight-storey building in the heart of town to a complex in Sennett Road, off Upper East Coast Road, where its newly set-up cultural academy is also housed. The association now occupies the former premises of Changkat Changi Secondary School. It spent more than $20 million for its lease from the Government and all the additions and alteration work were done over an 18-month period. These were completed in two phases, in January and June this year. The association moved in three weeks ago. The refurbished complex, where the association's pre- school started operating from January this year, has facilities that include a 500-seat air-conditioned auditorium, classrooms, dance studios and space for a restaurant or cafe. The association occupies only about 3,000 sq ft of office space for its 18 staff members there. 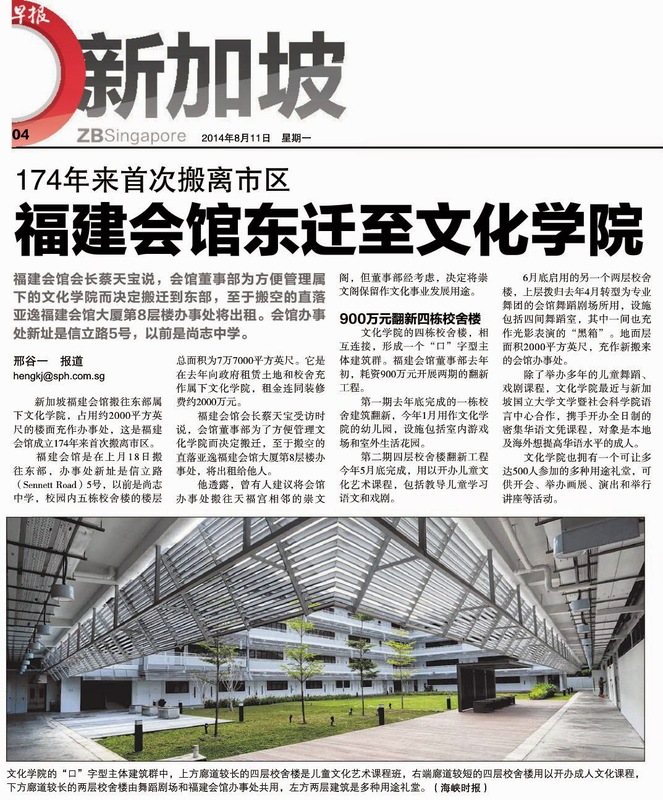 Its president, Mr Chua Thian Poh, 66, told The Straits Times that the move was to streamline administration and operations for greater efficiency. 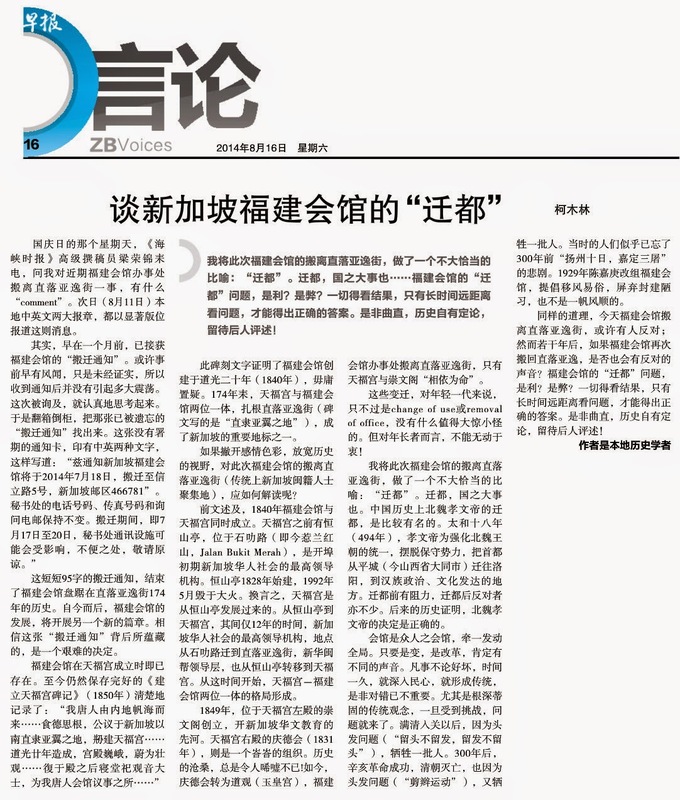 "With the space we have in our new cultural academy, we should make full use of it," he said. "It also makes good economic sense to have all the association's units housed under one roof so that staff members need not run between two locations." Besides the cultural academy, the new premises also house the association's arts and cultural troupe and its professional dance theatre group. 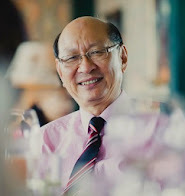 Mr Chua said some of his council members had suggested moving the association to an annex building, Chong Wen Ge, in Thian Hock Keng Temple in Telok Ayer Street, which it also owns and where the Hokkien Huay Kuan was started in 1840. The idea, however, was not taken up for practical reasons. "First, the space is limited and the young may not be attracted there," he said. 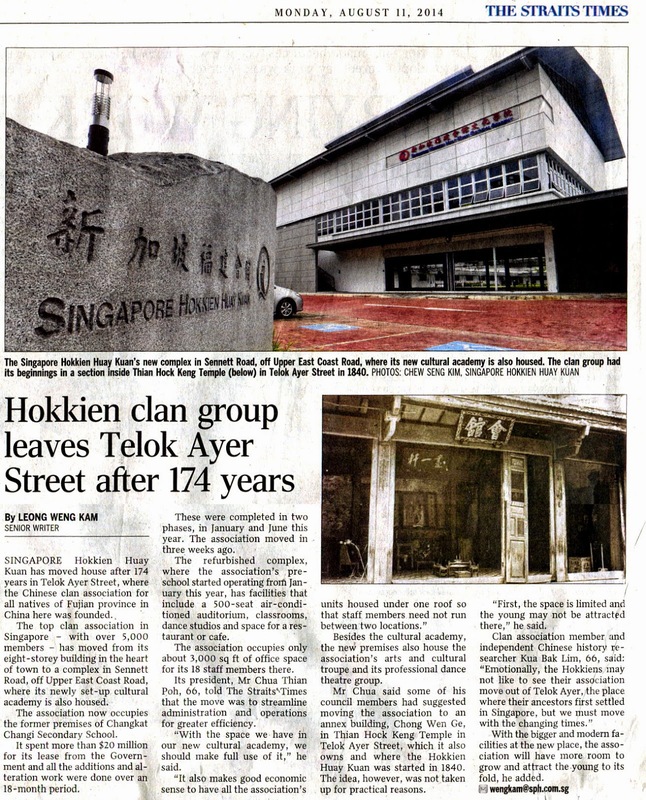 Clan association member and independent Chinese history researcher Kua Bak Lim, 66, said: "Emotionally, the Hokkiens may not like to see their association move out of Telok Ayer, the place where their ancestors first settled in Singapore, but we must move with the changing times." 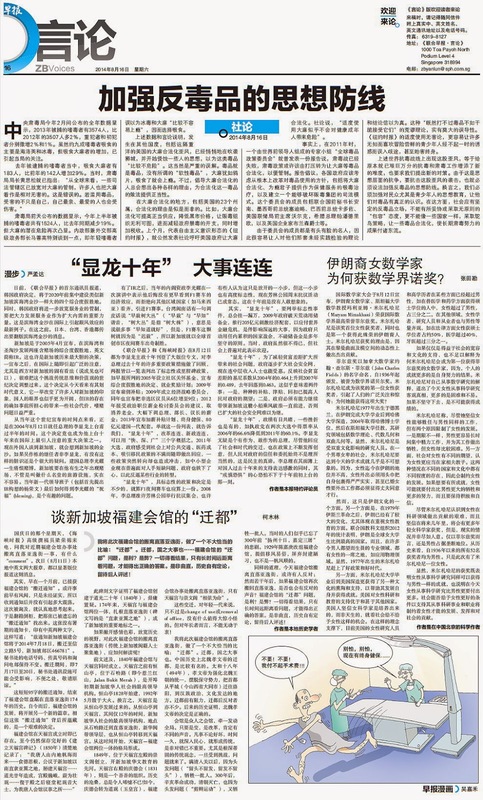 With the bigger and modern facilities at the new place, the association will have more room to grow and attract the young to its fold, he added.